Everyone from booking to leaving were so helpful and very nice! We so enjoyed everything you have to offer...It was indeed home away from home...made friends from everywhere and we will visit again! Very friendly team, a pleasure to work with. The team was great! We were a walk in and the service they provided was top notch. Sarah and Jonathan were a pleasure to work with! Our stay was excellent. 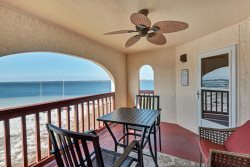 It exceeded our expectations of finding a great beach front condo as a walk in.. They were Very friendly and helpful.. Need to update the grills.. otherwise everything was perfect and amazing! This is our second year staying here and we will hopefully begging back next year. It is our favorite place to stay on vacation! Our room as always was very clean and accommodating! This is our second year at your property and Navarre Beach! We love it! Your property is excellent for a vacation: well-maintained, beachfront, and easy access. Both the check in and check out desk employees were very helpful, courteous, and professional. Excellent, professionals, quick and easy and friendly service. I was very pleased. They were very clean and very surprised to get the unit and amenities We recived for the priced we paid. This was great!